Can we just be friends again? Please? It’s been exactly five years now since I left you. During our time together, I poured all the emotion and energy I had into the products I helped build for you. Whilst it is only slightly more than two years since I left Microsoft, that grabbed my interest. The author goes though some of the products in which he invested emotional capital but saw Microsoft kill off. [I] fell in love with FrontPage, … But you threw it under the bus for no apparent reason. I bought my wife a Zune for her birthday … you gave up and now Zune is in the graveyard, may it rest in peace. Meanwhile, I feel like a sucker … again. Microsoft Digital Image Suite was the best image editing package ever to have existed for consumers. Yes, better than Photoshop Elements. … I want you to know that you truly broke my heart when you buried this product. I never used MS-Money. FrontPage passed me by. Being in a small area which Redmond calls “rest of the world”, I never got to buy a Zune. But I felt the heartbreak at the loss of Digital Image suite. It was one of the few non Xbox things I ever bought on staff purchase and I still use it. But my present pain is for Windows Live Mesh. Since I left Microsoft this product has quietly kept half a dozen key folders backed up to the cloud and replicated to all the computers I use. Microsoft have mailed me twice about their producticidal plans for Mesh. 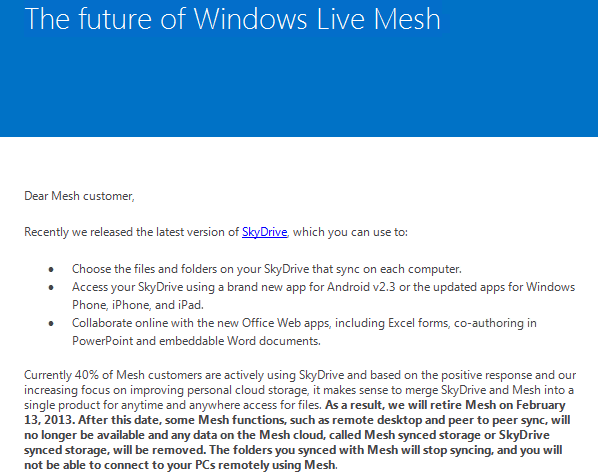 Worryingly, they say 40% of Mesh users are using SkyDrive meaning 60% are not. I never used Mesh’s remote access. But it can sync folders from all over my hard disk and SkyDrive needs folders to share a common root in order to sync them. I could move some of the folders I sync out of “My Documents” into “SkyDrive” but PowerShell (for example) insists on having its profile folder in a specific location. In short “out of the box” SkyDrive can’t do what Mesh can. With the the death of Mesh now only a week away, I decided to try something I’ve been meaning to do for ages. 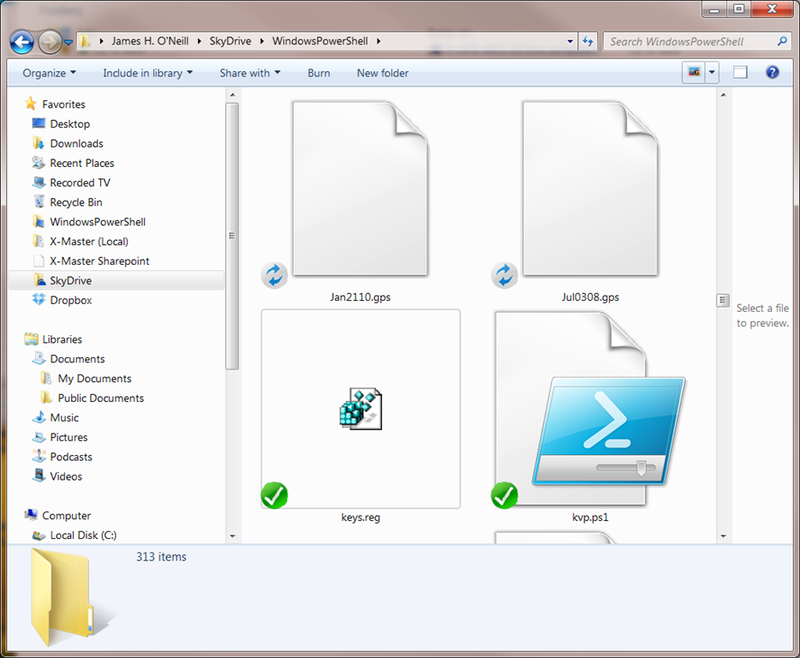 Create a symbolic link from the Skydrive folder to the “proper” folders where my files reside. It’s pretty easy. Creating Links requires an Administrative command prompt (unless you change the system policy on the machine), and you need a /d to tell MkLink it is a directory not a file – then it is a question of the name of the link and the place it links to and – cue drum roll – you have a link. The folder appears under SkyDrive, and right away the SkyDrive client starts syncing in the background. Maybe it is designed not to hog bandwidth or maybe it’s plain slow but on my computer it took a fair while to copy everything.